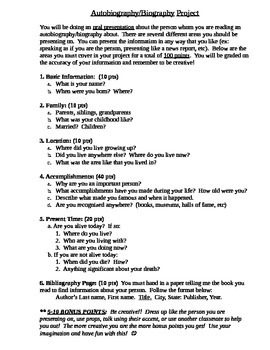 This is an outline for students to follow in order to complete a project on an autobiography or biography. The outline instructs students that they will be doing an oral presentation, but this can also be used for students to complete a written assignment. The outline totals 100 points and has 6 different sections for students to discuss including basic information, family, location, accomplishments, present time and bibliography page.